Los Angeles is the most populated city in California, and only the second most populated city in the US, after New York. The city is the focal point of the larger Los Angeles area. Those who visit Los Angeles will be able to should take advantage of the many attractions and amenities the city has to offer. When enjoying “LA,” utilize the great transportation services offered by United Checker Taxi. We will get you safely to and from any Los Angeles area destination whenever you may need it. We are a reliable and reputable transportation cab company that offer a large fleet of taxi cabs throughout the South Bay area. All of our professional taxi cab drivers will strive to meet all of your cab transportation needs, efficiently and timely and all with a courteous attitude. Los Angeles is a beautiful city that takes full advantage of California’s beautiful climate. Los Angeles also benefits from a wide range of creative individuals and is known as the “Creative Capital of the World,” with one out of every six residents working in a creative industry. Los Angeles is home to Hollywood and is globally recognized as the epicenter of the motion picture industry. With the stress traveling can bring, give yourself a treat by calling United Checker Taxi. Traffic and parking can be a nightmare! Spend less time stressing and more time relaxing by calling our professional and courteous taxi cab drivers at United Checker Taxi. We are proud to offer our clients timely and reliable drivers who will get you to your destination in Los Angeles. Being the oldest and most efficient taxi cab company in the South Bay area, United Checker Taxi is proud to provide you with experienced taxi cab services in Los Angeles. Our speedy airport transportation services relieves you of the worry of parking and traffic while getting you to the airport on time. We offer airline transportation to Los Angeles International Airport (LAX) and Long Beach Airport. No matter the time of your flight, we will have you there on time. Whether you are traveling alone, with your family or a large group, our professional drivers at United Checker Taxi can assist you with any transportation need. If you want safe and reliable taxi transportation throughout the South Bay and Los Angeles area, United Checker Taxi is ready and available. If you have mobility issues, we also offer vehicles with paratransit assistance. We can also transport large groups efficiently and quickly. When you contact us, our team will work diligently to set out a plan to meet your transportation needs. You can contact us at United Checker Taxi by phone, text or online. Schedule a pickup in advance or simply call us when you need a ride and we will be there. 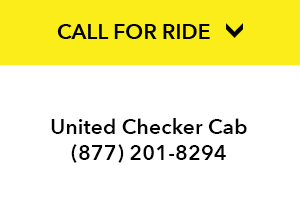 Choose the best taxi service when you call United Checker Taxi. We are a dependable, clean and trustworthy cab company who can get you where you need to go!